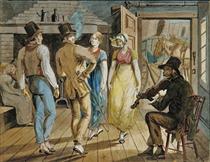 John Lewis Krimmel (May 30, 1786 – July 15, 1821), sometimes called "the American Hogarth" was America's first painter of genre scenes. 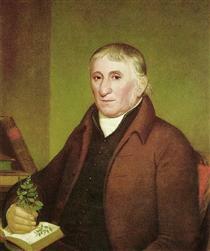 Born in Germany, he emigrated to Philadelphia in 1809 and soon became a member of the Pennsylvania Academy of the Fine Arts. Initially influenced by Scotland's David Wilkie, England's William Hogarth and America's Benjamin West, he soon turned to direct observation of life for his genre scenes. 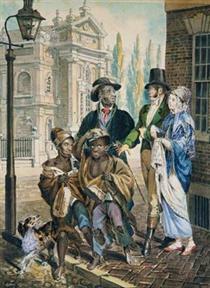 He was among the first artists in America to portray free blacks, such as in Black People's Prayer Meeting (1813). 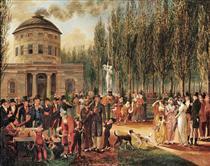 Among his still frequently reproduced paintings are Fourth of July, Center Square (1811/12) and Election Day (1815), both filled with lively characterizations of scores of crowd members.  Krimmel died in a swimming accident at the age of 35. Among the prominent American artists influenced by Krimmel's work are William Sidney Mount, George Caleb Bingham, and Thomas Eakins. Johann Ludwig Krimmel was born on May 30, 1786 in the small town of Ebingen in the south German duchy of Württemberg. 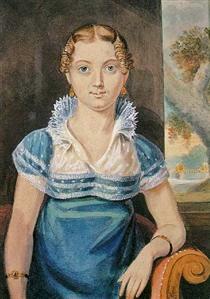 In 1809, Johann Ludwig decided to join his older brother, who had immigrated to Philadelphia. Initially he planned to engage in business with his brother, but soon abandoned this occupation for art. Though he may have had some watercolor lessons in London, Johann Ludwig had no real formal training in art when he reached Philadelphia about November 1, 1809. 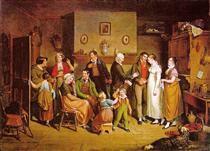 The 1812 city directory listed Krimmel (who by now had Anglicized his name to John Lewis) as a painter. He began by painting portraits, but, a copy of David Wilkie's Blind Fiddler falling in his way, his attention was turned to humorous subjects. He also painted historical pictures. At that time Philadelphia was the intellectual and cultural center of the United States. Here Krimmel soon joined the first known sketch club in America whose members included Thomas Sully and Rembrandt Peale. 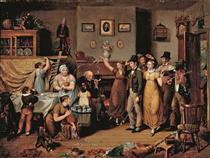 His first painting to excite public notice was Pepper-Pot: a Scene in the Philadelphia Market, 1811. 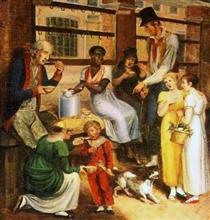 The oil depicted a black woman ladling out bowls of her uniquely Philadelphian spicy soup to white customers of various ages, heights and social classes. 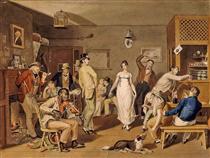 This genre scene or depiction of contemporary everyday life was soon followed by many more in his sketchbooks and canvases like Blind Man's Buff (1814) and Country Wedding (1814). In all of his known oils, Krimmel included at least one animal (usually a frisky dog) sometimes two or three. Pavel Svinyin, a Russian on a diplomatic mission to Philadelphia between 1811 and 1813, apparently bought roughly 14 sketches from Krimmel and presented them back in Russia along with works from a variety of sources as typical American scenes which he had painted. The pictures in the so-called Svinin Portfolio include Black People's Prayer Meeting, Deck Life on One of Fulton's Steamboats and Morning in Front of Arch Street Meeting House, which showed Quakers in their Sunday best. The Svinin Portfolio is now in the Metropolitan Museum of Art in New York. 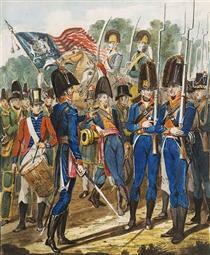 Though formerly thought to be Svinin's own work, the watercolors are now generally attributed to Krimmel. 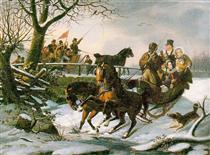 4th of July 1819 in Philadelphia John Lewis Krimmel ? Black People's Prayer Meeting John Lewis Krimmel ? 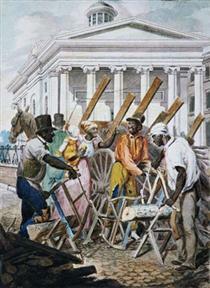 Black Sawyers Working in Front ot the Bank of Pennsylvania, Philadelphia John Lewis Krimmel ? Blind Man's Bluff John Lewis Krimmel ? Members of the City Troup and other Philadelphia Soldiery John Lewis Krimmel ? 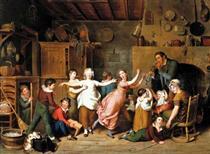 Merrymaking at a Wayside Inn John Lewis Krimmel ? 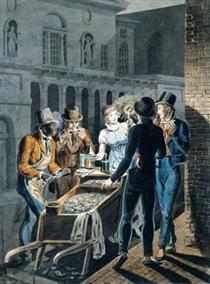 Nightlife in Philadelphia - An Oyster Barrow in front of the Chestnut Street Theater John Lewis Krimmel ? Portrait of Jacob Ritter Sr. John Lewis Krimmel ? 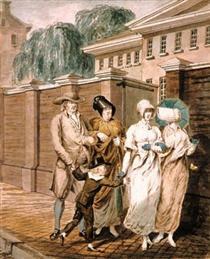 Sunday Morning in front of the Arch Street Meeting House in Philadelphia John Lewis Krimmel ? The Sleighing Frolic John Lewis Krimmel ? 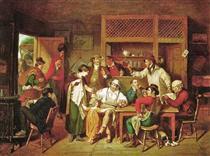 The Village Tavern John Lewis Krimmel ? Young Girl With A Blue Dress John Lewis Krimmel ?